Hillary Clinton received an endorsement Tuesday for her White House bid from America’s largest lesbian, gay, bisexual and transgender civil rights organization. 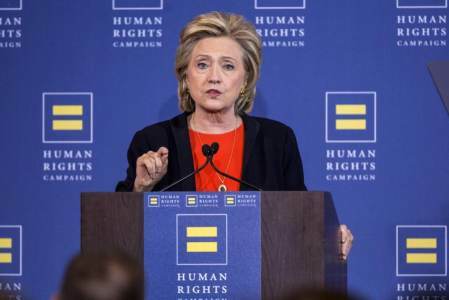 The Human Rights Campaign announced its endorsement for the Democratic front-runner, which she is expected to officially accept at an event in Iowa next week ahead of the state’s leadoff Feb. 1 caucus. The organization’s board of directors, comprised of 32 community leaders nationwide, voted to endorse Clinton, the group said in a statement. The Human Rights Campaign said it will work to mobilize its 1.5 million members and supporters ahead of the general elections in November. Last year, the U.S. Supreme Court historically ruled to allow all Americans, regardless of gender or sexual orientation, to marry. Many in the LGBT community fear the decision could be reversed if a conservative president is elected to office. “All the progress we have made as a nation on LGBT equality — and all the progress we have yet to make — is at stake in November,” Chad Griffin, president of Human Rights Campaign, said Tuesday. “Despite the fact that a majority of Republican and independent voters today support federal protections for LGBT Americans, the leading Republican candidates for president have threatened to halt progress as well as revoke, repeal, and overturn the gains made during President Obama’s two terms,” the statement said.